Easy Street Vacation Rentals was organized as an LLC (Limited Liability Company) in October of 2002 as a Short Term Vacation Rental company specializing in Pet Friendly accommodations. Rick and Debbie Scali own four homes and manage the remaining homes for friends and out of state owners referred by friends. "The Mission of Easy Street Vacation Rentals is to offer the short-term rental of clean, well-maintained, pet and family friendly accommodations close to the beach, and to offer these accommodations at a fair and competitive price. Easy Street Vacation Rentals will primarily cater to middle class working families, with a special focus on families with clean, well-behaved pets, pets that are considered part of the family, and to offer these accommodations in a professional and businesslike manner, while still maintaining personal and responsive hands-on service. 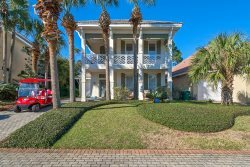 And finally, to be considered the leading and most well-respected Pet Friendly Vacation Rental Company in the Destin and immediate area".